This exhibition used one of theorist/writer Frantz Fanon's key texts, Black Skin, White Masks, as a starting point for artists to respond to. Artists: Lyle Ashton Harris, Black Audio Film Collective, Sonia Boyce, Renée Green, Isaac Julien, Glenn Ligon, Marc Latamie, and Steve McQueen. An exhibition of multi-media work by eight different artists as part of the ICA’s season, ‘Mirage: Enigmas of Race Difference and Desire’ focused on the work of writer and theorist Frantz Fanon. The exhibition used one of Fanon’s key texts, ‘Black Skin, White Masks’, as a starting point. Artists: Lyle Ashton Harris, Black Audio Film Collective, Sonia Boyce, Renée Green, Isaac Julien, Glenn Ligon, Marc Latamie, Steve McQueen. 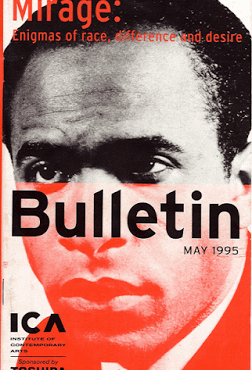 A publication of the same name to coincide with the exhibition charts the recent history of the relationship between contemporary art and culture and the ideas of the writer and theorist Frantz Fanon. Contributors: David A. Bailey, Kobena Mercer, Catherine Ugwu.